Hello Everyone! Hope you had a wonderful Thanksgiving! 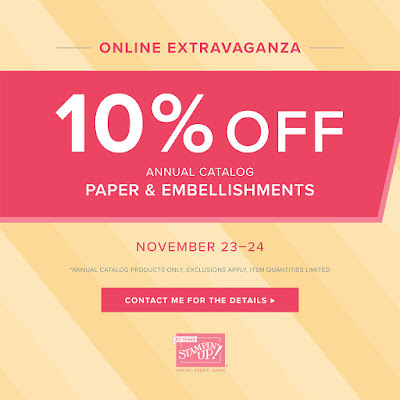 Our annual Online Extravaganza promotion started yesterday. This year's promotion is a little bit different from past years - Six Days. Three Sales. One Spectacular Promotion!!! Online Extravaganza is run for 6 days. During this time, there are three, 48-hour sale featuring a selection of products from the 2018-2019 annual catalog - all at 10% off! Each 48-hour sale features two product categories (e.g., paper, stamps, ink, etc). When one sale ends, the next sale begins. By the end, nearly every item from the annual catalog will have been on sale! 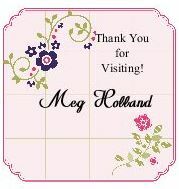 If you like to see the full selection of discounted items during each 48-hour sale, visit my Online Store (click on SHOP NOW). Each sale is given its own category, which contains all available discounted items for that particular 48-hour sale. Bundles - will not receive additional discounts during this promotion. Item quantities are limited. Depending on inventory levels, discounted pricing may or may not be available for items featured in the promotion throughout the entirely of each 48-hour sale. Snowflake Showcase Promotion Starts TODAY!